Vinca major, also called big leaf periwinkle, blooms larger flowers and leaves and is taller than its close counterpart, Vinca minor. It is also more aggressive and can become invasive in the home landscape. 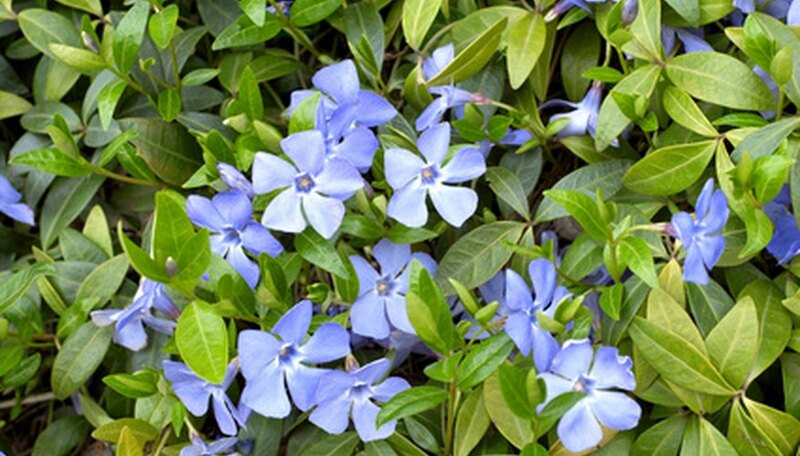 It does, however, make an excellent ground cover, blooming periwinkle-colored flowers and growing up to two feet tall. It can quickly fill in a space within a year if spaced 6 inches apart at planting time. If you want to get rid of your Vinca major all together, perhaps because you are having trouble controlling it, then do so in the late spring or early fall when the plant is most actively growing. Wait for a warm day that is between 70 and 80 degrees Fahrenheit. It should be a dry, calm day as well. Cut up the Vinca major with a weed whacker or brush cutter. Do not try to remove the plant, just injure it to open up the cuticles for the herbicide to work better. Mix glyphosate with water in a backpack or handheld herbicide sprayer to create a 5 percent glyphosate solution, as indicated on the label instructions since glyphosate comes in different concentrates. Note that glyphosate kills other plants and grass it comes in contact with. If you’re concerned about this, make a 3 percent solution to lessen the risk, but expect some of the Vinca major to survive. Alternatively, purchase a use a ready-to-spray 3 or 5 percent glyphosate solution, available at most home and garden centers. Spray the glyphosate solution evenly on the plant’s foliage. Do not get it on other plants and grass, even if you’re using the 3 percent solution. It still can kill them, too. Reapply the glyphosate to the Vinca major in two weeks to any plants you may have missed or that survived. Check again the following spring or fall for any new growth and reapply as necessary. Manually pull Vinca major up as an alternative to using an herbicide. Continue to remove every three months if the plant grows back.